The ex•tend•it 2x1 HDMI Switcher enables effortless HDMI source switching using a single high definition display. A simple and reliable solution, the 2x1 HDMI Switcher links any two HDMI sources (DVD players and satellite set tops) to one HDMI display. It completely eliminates the need to disconnect then reconnect multiple HDMI sources, saving time by providing a fundamental tool that brings it all together behind the scenes. When all three devices (the display plus the two sources) are connected to the 2x1 HDMI Switcher and powered on, you simply select which source you want to view on the display using the Switcher, the IR remote that comes with it, or any universal remote you program to work with the Switcher. HDCP (high bandwidth digital content protection) is a standard encoded into the video signal to prevent it from being pirated. If a source device is HDCP coded and is connected to a HDMI display or projector without the proper HDCP decoding mechanism, the picture is relegated to “snow” or in some cases, very low (480P) resolutions of the images. 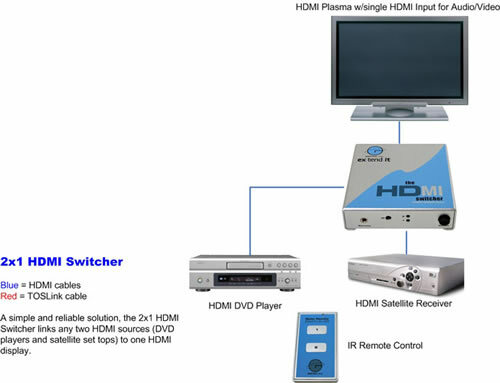 In order to see HDTV with HDCP compliance, both the source, the display and any device in between must be equipped with HDMI connections that can enable HDCP decoding, such as the 2x1 HDMI Switcher. Simply connect your HDMI display to the Switcher’s display output. Then connect both HDMI sources to the Switcher’s inputs using the HDMI cables that come with the Switcher. Once the sources, the Switcher and the display are all powered on and connected, you simply select which source you want to view. Maintains high resolution video—beautiful, sharp HDTV resolutions up to 1080P are easily achieved. For computer users, the 2x1 HDMI Switcher conforms with HDMI specifications for resolutions up to 1920 x 1200. Compatible with all HDMI-equipped, HDCP-enabled HDTV devices.